BEIRUT, Lebanon - Air strikes killed 40 civilians in the last opposition-held town in Syria's Eastern Ghouta on Friday and the army launched a ground offensive on its outskirts after talks sputtered over a rebel withdrawal. Moscow announced a deal with Jaish al-Islam last Sunday, ushering in 3 consecutive days of evacuations from Douma that saw nearly 3,000 fighters and civilians bussed to northern Syria. "At least 40 civilians including 8 children have been killed in air strikes and rocket fire on Douma," it said. On Douma's outskirts, Syria's army entered fields surrounding the town, state news agency SANA said. "The hospital is in a state of panic," the medic said. "Dentists are carrying out emergency surgeries. Dead bodies are being brought in pieces and are unrecognisable." "It feels like we're back in the days of the Gaza war" when Israel was bombing the Palestinian enclave and people around the world watched, he said, giving his name only as Mohammed. It said mortar shells hit several suburbs of the capital and killed at 4 people and wounded more than a dozen. The enclave on the eastern edge of Damascus had escaped government control since 2012 and, although it had shrunk over the years, it still covered sizeable territory 2 months ago. The daily air raids kept residents cowering in basements for weeks and a ground assault soon sliced the area into 3 isolated pockets, each held by different rebel factions. The first 2 were evacuated under Russian-brokered deals last month that saw more than 46,000 rebels and civilians bussed to the northwestern province of Idlib, which the regime does not control. As talks over the third and final pocket of Douma dragged on, Russia and Syria's regime threatened Jaish al-Islam with a renewed military assault if they did not agree to withdraw. The nature of the ongoing discussions over Douma is unclear and Jaish al-Islam itself has not stated its position since this week's first evacuation. SANA reported that they fell apart when rebels refused to release detainees they were holding in Douma, and said Friday that "military operations against Jaish al-Islam will not stop until the hostages are released." 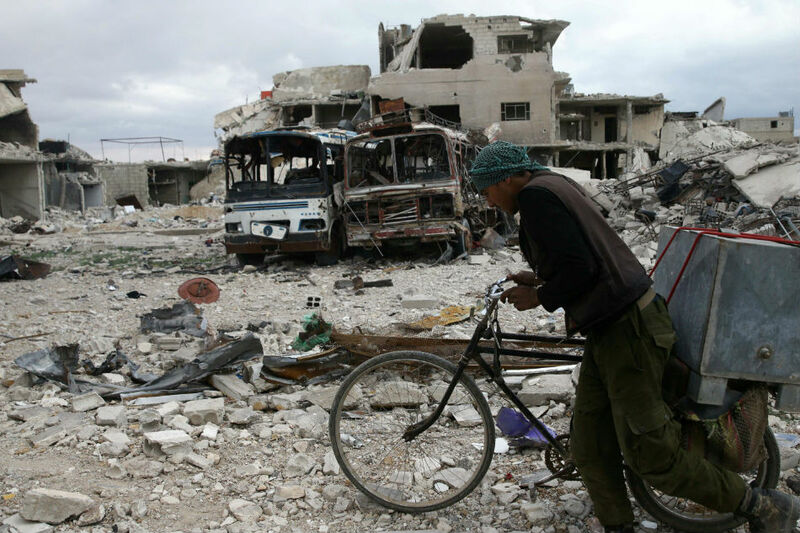 The group appears to have little leverage, however, to face the regime's recovered might, and the latest strikes raised fears of a brutal end to the five-year-old siege of Eastern Ghouta.